Since its launch in India, the Honda City became a dominant force in the midsize sedan segment. Now, while Maruti Suzuki attempted a few times to dethrone the City from its status, they never quite managed to succeed. However, all of that changed in 2014, when Maruti launched the Ciaz. The midsize sedan segment finally had a contender from Maruti to give the City a run for its money. Maruti also nailed the pricing of the Ciaz, increasing its value for money quotient. In fact, it was so good that it was one of our ‘Best of 2014’ machines. But that was four years ago, and a lot has changed since then. The Ciaz was in the need of an update, which it received this year – mostly in terms of styling and features. But, with new and more stringent emission norms coming in place, Maruti has done something very clever and also equipped the new Ciaz with a new 1.5-litre petrol motor mated to a smart hybrid system. 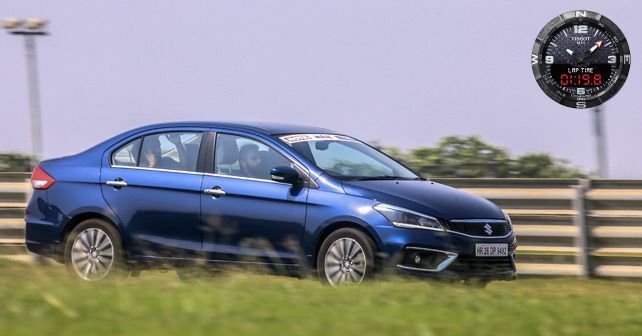 Driving the Ciaz on the road, and on the track, allowed us to make some phenomenal observations. Interestingly, the updates aren’t just limited to appearance, they run deeper. The new Ciaz is far more refined than the previous model, and more efficient as well. The car feels quite balanced and corners well. Though the engine is not designed to be a rev monster, being a petrol – unlike most offerings in the segment – it has good top-end grunt. Additionally, the car handles so well that it was just one tenth of a second slower than the new, lighter and smaller, Swift on the track. This just goes to show how good the chassis and drivetrain really are. However, at expressway speeds, the car is prone to being unsettled by larger vehicles. Also, the electric power steering could provide better feedback to the driver. Moreover, while quality levels have improved, they could have improved further. At its price point, and given the competition, the Ciaz provides exceptional value for money – and that’s where it really scores, not to mention in the space and comfort that it offers for the price. With our sensible hat on, it would be our pick in the segment.